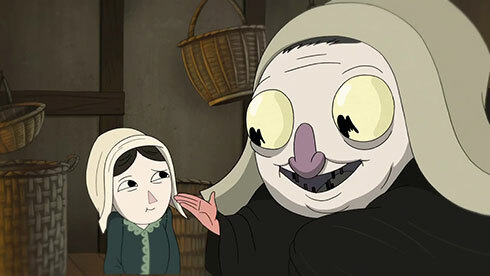 I know I am super late in the world of animation bloggers with this post but I finally got around to seeing the Cartoon Network series Over the Garden Wall from last year and let me just say the hype is deserved. Wow! 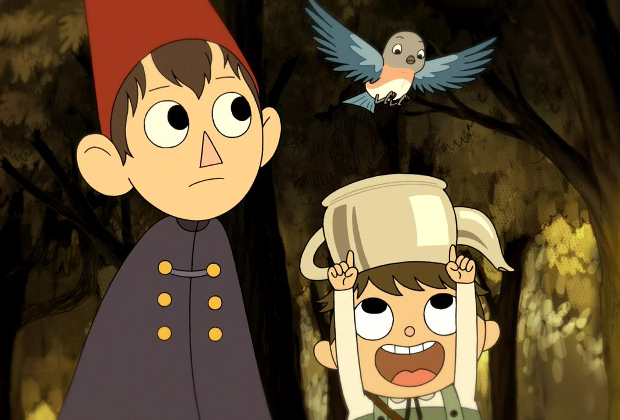 Created by Patrick McHale from a short he did called The Tome of the Unknown, Over the Garden Wall is a miniseries about two step-brothers who get lost in a mysterious forest world. The only way I can think to describe it is a mixture of Wizard of Oz and Alice in Wonderland. It has the randomness of Alice and the journey of Wizard. For people that bemoan the state of 2D hand drawn animation this is stunning. It looks so beautiful particularly how it uses light to create layers of the forest and to show mood. I was blown away by the animation! It’s unique and shows a lot of different styles while still keeping a consistent feel. 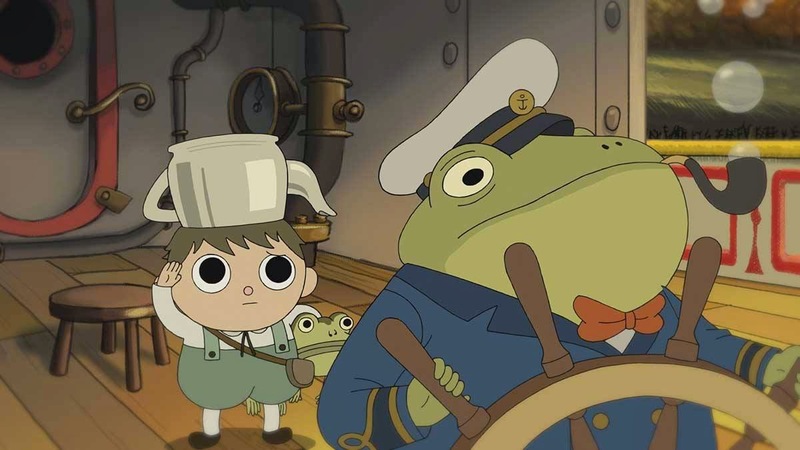 It is carefully done animation with little details like the lighting on Greg’s teapot hat always reflecting what’s going on or the colors and texture on Beatrice’s wings. It’s lush, varied, and it reminded me in animation quality of Spirited Away- no small compliment! Each episode is actually 2 10 minute shorts or chapters in the story of getting the boys Wirt (Elijah Wood) and young Greg (Collin Dean) home. They are such well written complex characters especially Wirt. He worries about life and doesn’t like to take risks. He’s resentful of Greg and I think a little bit envious. He wishes his family wasn’t a blended family and that Greg didn’t even exist. He wants to go back home but he is not unempowered or weak. Greg is sweet and carefree. He loves nature and carries around a frog that he often gives historical names too. He is unafraid of monsters and when given the chance to lead he takes it very seriously. A character like Greg could be grating and irritating but he’s not. He also gives most of the humor of the show (and it can be very funny). They have a third member of their group a blue jay named Beatrice (Melanie Lynskey) who joins the boys to try and find Adelaide a mysterious woman who will break the curse on her family and help the boys get home. Beatrice gets irritated easily and is free with her opinion about everything. It’s a funny juxtaposition given she’s a sweet looking bluebird without being too crass or vulgar. Her character arc has much of the heart of the series. There is a beast in the forest and a woodsman (Christopher Lloyd) as well as other magical creatures. It can be quite scary and probably isn’t for very small children. But the segments are short so you are never left dwelling on the scary for long. 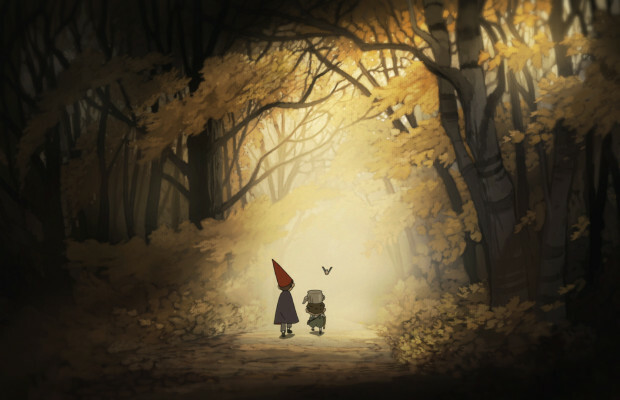 In a world where hardly anything feels new Over the Garden Wall is such a refreshing surprise. Every episode feels like something I’ve never seen before. It’s so creative and different and constantly surprised me. It might be a little too random for some people but I thought that’s what made it brilliant. You never knew what to expect. It could be a bonfire with vegetable people or frogs on a cruise or a trip into the clouds. Whatever it is I loved it! I love how the boys interact with each other. It felt like 2 brothers, especially two step brothers. I like that they never had to ‘learn’ anything and yet they did. It’s not one of those animated shows where there is a moral at the end of every episode. Sometimes there isn’t even a story. It’s just the boys interacting with cool stuff (again kind of like Alice in Wonderland in that regard). The music is also wonderful and eclectic. Some songs are very fun like Potatoes and Molasses, others are spooky, others are very tender and heartbreaking. I’m not sure who wrote the score but it is perfect. It manages to feel consistent with all the eclectic stories being told. Normally I hate when adults play children on animated shows (Simpsons being the exception) but here Elijah Wood is terrific as Wirt. He captures a skeptical but earnest teen so well. All the vocals are great including John Cleese, Tim Curry, Chris Isaak, Shirley Jones and more. You can tell this was a real labor of love for all involved. People are always bemoaning the lack of originality in today’s television and movies. Indeed it feels like every day we get a new sequel, prequel, remake or adaptation. This makes Over the Garden Wall even more of a treasure. It’s so original in every way. I think you could watch it a thousand times and get something new each time. Each episode is so rich with details and artistry it is definitely one I want to get on blu-ray. Especially as lovers of animation we need to support such creative visionaries and let the Cartoon Network know such efforts are appreciated. 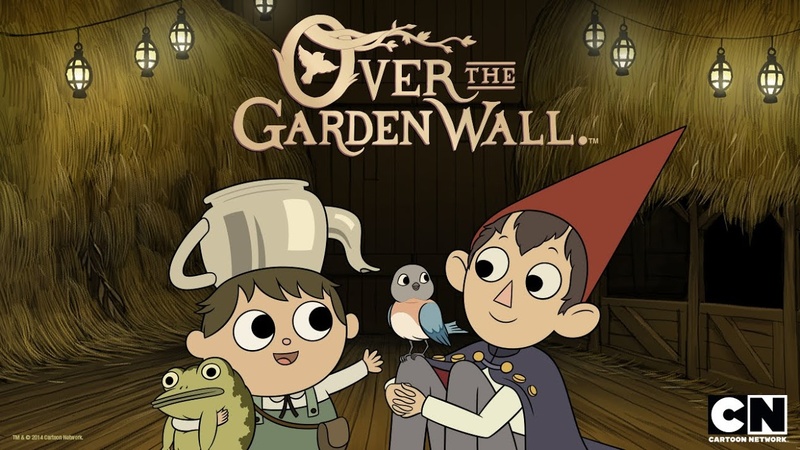 I would love to see a series 2 of Over the Garden Wall but I hope at least the network will continue producing such bold entertainment. 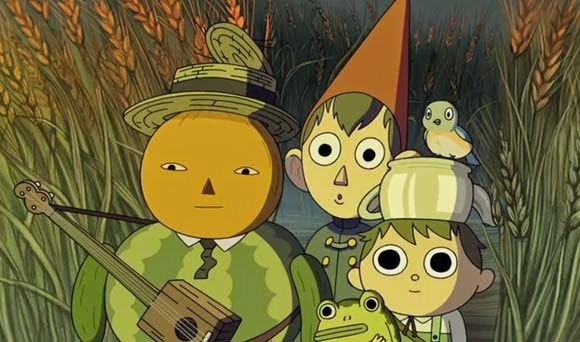 Any of you see Over the Garden Wall? What did you think? It’s the kind of series you want to discuss so feel free in the comments. This shows how deep the series is. I’ve been thinking of giving this a shot. I mean, Christopher Lloyd is in it? That’s enough for me! He is. A small part but he’s there. It’s so great. You should definitely watch it. I was blown away on every level. 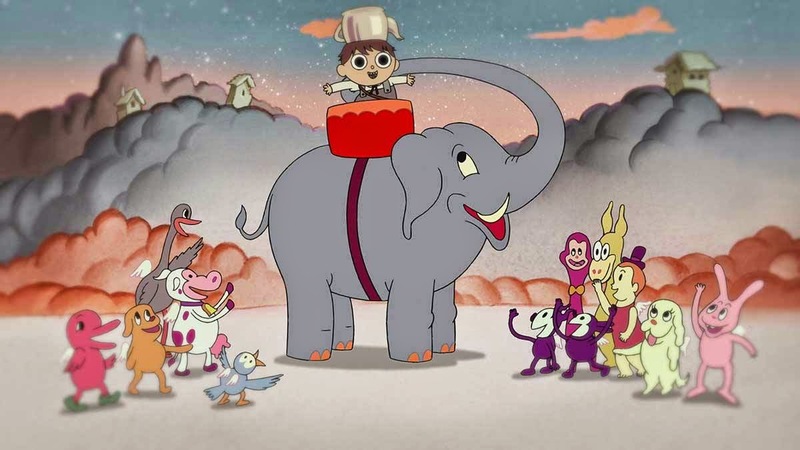 Pingback: Animated Emmy Noms 2015 | Reviewing All 54 Disney Animated Films And More!